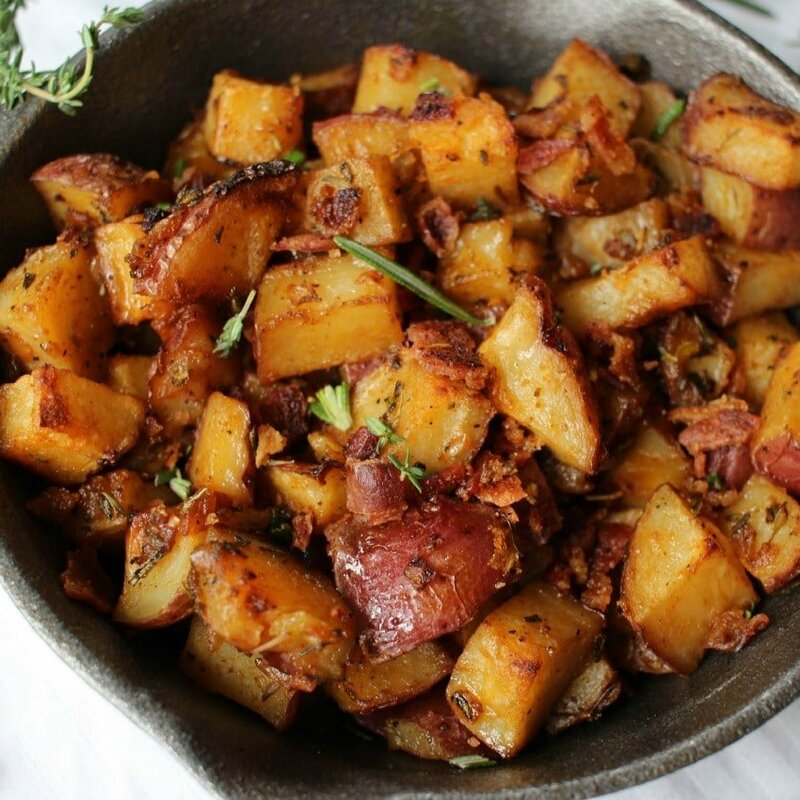 Perfectly seasoned and roasted breakfast potatoes topped with sweet caramelized onions, bacon pieces, and topped off with fresh herbs! I love breakfast foods, of all kinds! As a kid, breakfast for dinner was one of my favorite meals to have… and it still is today 😀 The next time you’re thinking of what to have alongside your eggs or sausage, try these breakfast potatoes. 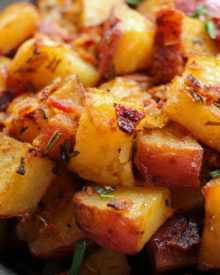 Perfectly seasoned and roasted red-skin potatoes topped with caramelized onions, crispy bacon and fresh herbs. 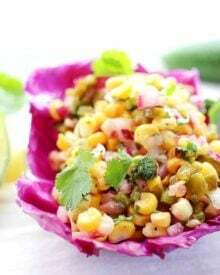 The perfect side dish for breakfast! 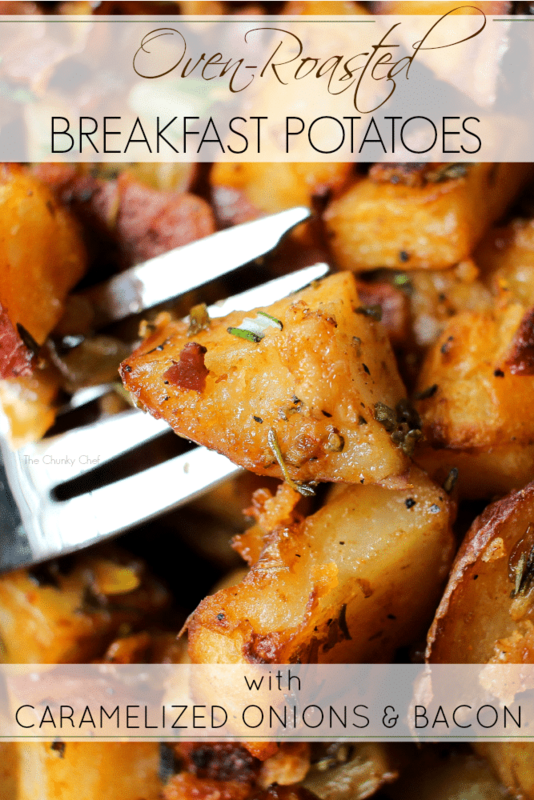 Usually I prefer hashbrown potatoes, due to some “home fries” not being cooked all the way through (I’m picky about my potatoes lol)… but these are the perfect combination of crispy on the outside and fluffy and soft on the inside. Not to mention the fantastic seasonings on these potatoes. Smoked paprika is the star of this recipe! The smoked paprika is what gives these potatoes a golden color. If you haven’t tried smoked paprika yet, you should 🙂 It’s, well, smoky (I’m sure you’re just so surprised…. 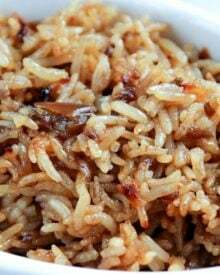 ), but seriously, it’s a smoky sweet spice that brings an earthiness and depth of flavor to this dish. Option 1 – Cook 5-6 slices of bacon in a skillet (or bake in the oven), and save the rendered bacon grease. Use that saved bacon grease as the “oil” in the recipe, so the onions and potatoes are coated in bacon grease and roasted. Crumble bacon and add once potatoes are done cooking. 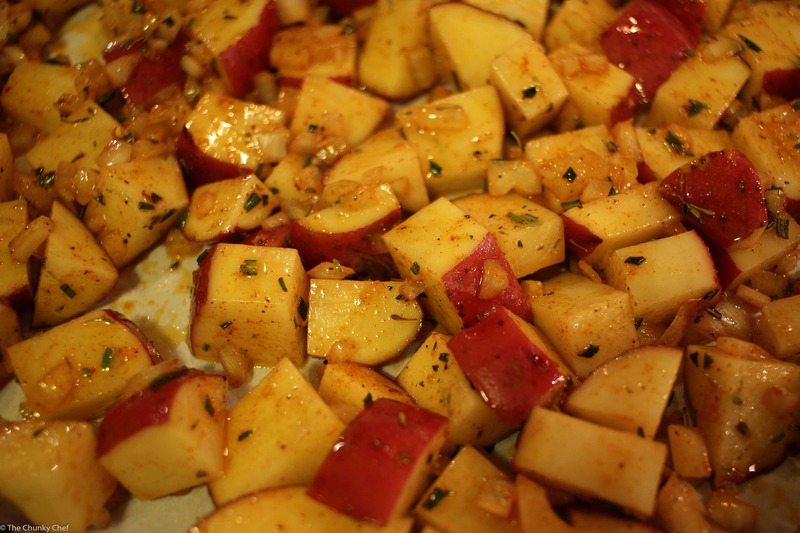 Option 2 – Coat the potatoes and onions in olive oil and roast. Cook bacon separately and add once potatoes are done cooking. Once your potatoes are done roasting, top them with some minced fresh rosemary and thyme (optional but recommended). NORDICWARE BAKING SHEET – My all-time favorite rimmed baking sheets! SMOKED PAPRIKA – This is a brand I use all the time! 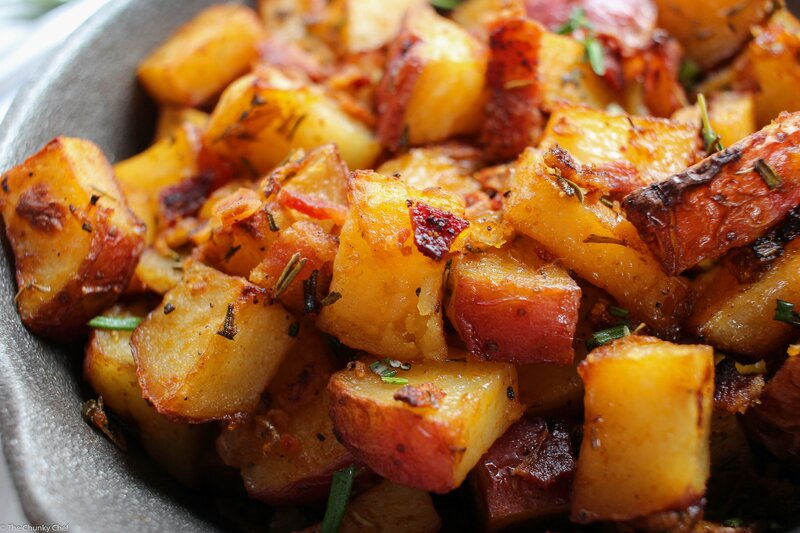 Perfectly seasoned and roasted red-skin potatoes topped with caramelized onions, crispy bacon and fresh herbs. The perfect side dish for breakfast! Cook bacon slices in a skillet, removing with slotted spoon to a paper towel lined plate to drain. Reserve bacon grease. In large bowl, combine potatoes, onions, herbs and seasonings, and reserved bacon grease and toss well to evenly coat potatoes. Arrange in single layer on baking sheet. Bake for about 40 minutes, tossing halfway through, until potatoes are golden brown and crispy. Top with crumbled bacon pieces and minced fresh herbs to garnish. 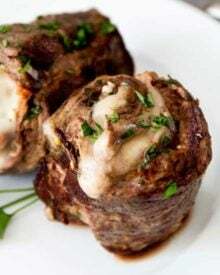 I made these without the onion and bacon plus I added some regular paprika for more color, onion powder, garlic powder, a lil cayenne for kick and parsley and they came out amazing. Everyone loved them! I like try with the bacon and onion next time. I have been looking for a breakfast potato recipe and yours is the best yet. Simple yet flavorful. Do you think you could cook them in the oven and keep them warm until you serve? Would they get mushy? I’ve never tried that, so I can’t say for sure. I’ve made these with sweet potatoes a few times. White or yellow sweet potatoes work best (though they’re harder to find) the orange ones stay too wet and break/crumble apart easily in my opinion. Maybe next time I’ll try half white pots and half orange sweet pots and see if that helps. Good recipe though! Could you bake the potatoes the night before? I’m having a brunch and trying to find the least to do in the morning. Hi Leslie 🙂 You could, but they won’t be as crispy reheated. Can you use frozen potatoes. If I cut potatoes, onions and pepper could I freeze and then cook frozen and add herbs? Hi Melissa 🙂 I’m sure you could cook them frozen, but I’ve never done it, and it would probably take some tweaking to get it so they’re cooked and crispy. Turned out beautifully, thank you. These were great. I took them a step further. I placed the roasted potatoes and onions in a cast iron pan, added the diced corned beef and 1 tbsp. Each of cream and dijon mustard. Blended well and crisp in the pan. I served it with eggs and Panaras rye bread. AMAZING! Hi Betsy 🙂 Oh my, what a wonderful addition to the potatoes… awesome job!! I’m so happy you loved them! AWESOME! ! Exactly the recipe I was hoping to find for Easter brunch! And I already have smoked paprika! Can’t wait to make these! Thank you! 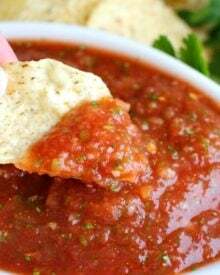 Omg i want to make these right now, but i dont have any rosemary or thyme and only have regular paprika. Can i use any other herbs to create a delicious pan of potatoes like this, or should i hold out until tomorrow and buy the ingredients. Looking forward to trying out this recipe for my sister’s birthday brunch this weekend! Do you think that if I made it the day before it would reheat well the next morning? Thank you for sharing!! Hi Katie!! I’ve never made it that way before, but I think it should be okay… although I would add the herbs after you reheat it, otherwise they’ll turn black-ish. And I’d definitely re-heat it in the oven so they stay nice and crispy 🙂 I hope you all love them!! Oh breakfast potatoes how I drool for you ! These look like the perfect start to a great day! Delish! I had the best breakfast potatoes at brunch this morning and was just thinking they’re never as good at home. 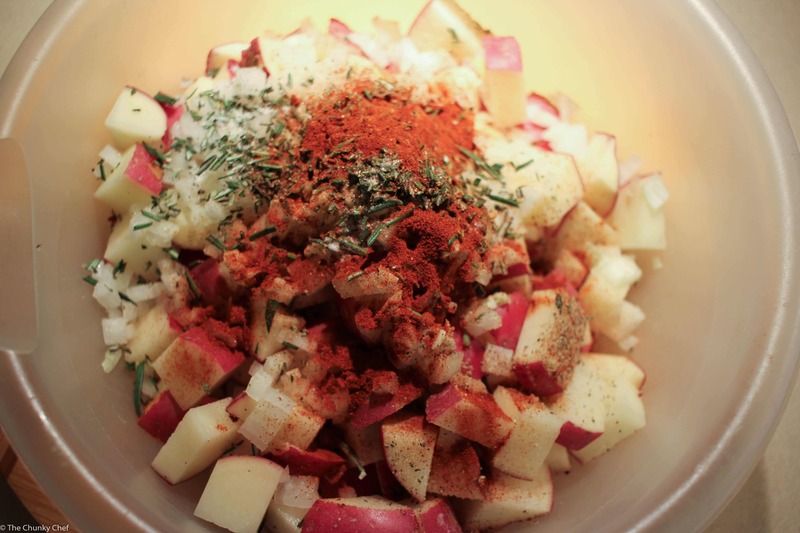 This recipe looks like it would put up a great fight for title of best breakfast potatoes! 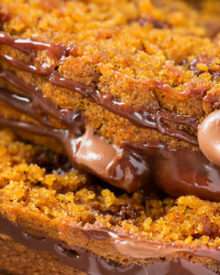 Helloooo, comfort food! These would disappear so quickly if I was around! Yumm, these would be awesome in a burrito! I enjoy reading your blog. You do a terrific job not just with the recipe but with making your readers feel like we are sitting in the kitchen of a friend. 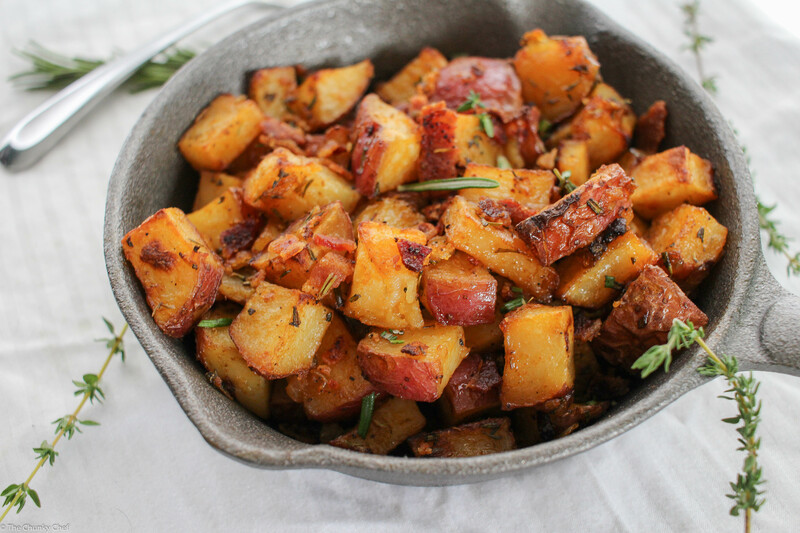 Roasted potatoes for breakfast are a must! Caramalized onions sound like such a yummy addition. Thank you so much Kimmie! 🙂 I’ll be there this evening for sure, always a great party! Those potatoes look so temptingly delicious! Thanks for sharing! I could eat potatoes in every shape and form all day, every day. This recipe just hit the spot. Thanks for linking up at Thursday Favorite Things, hope to see you again this week. Thank you!! I’m a huge potato addict as well 🙂 See you this Thursday! Thank you so much for sharing at my Tuesday link up! 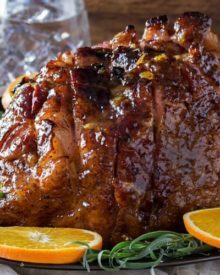 This recipe looks AMAZING…in particular I can imagine it would hit the soul food button after a late night out with a few cocktails. Sometimes its good to be bad with that bacon grease. Oven roasted potatoes are my daughter’s favorite. I will try it your way next time. looks scrumptious. got eggs? I’m ready with this recipe! awesome post! These look so good Amanda, for me, I’d leave out the bacon, and tuck in!! I’m a sucker for anything involving potatoes. These look delicious. I’d eat them for any meal. Yum! 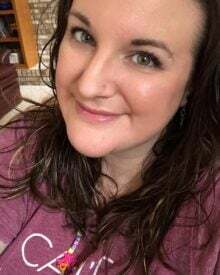 Thanks for sharing on OMHG Wordless Wednesday! I love breakfast potatoes! When I am travelling, we go to truck stops to enjoy a heavy breakfast and invariably their home fries. I have not tried it at home though! 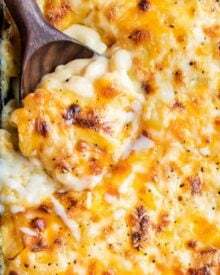 This recipe is so good that it is tempting me to make some at home! I am not a breakfast person and usually skip it. My husband makes some good breakfast potatoes and once in a while I might sneak a bite. Funny though, one bites lead to another and another…before you know it, I have eaten a whole portion. These potatoes look great, and I know that it would be hard to stop eating them once I start! Yum!! I have the exact same thoughts with you about potatoes! I prefer hash in cases where I’m going to get big potato chunks that are almost cool on the inside- but if I’d have the choice between hash or THESE potatoes- I’d definitely pick these- they’re definitely cooked perfectly, just the way I like them. There is this breakfast place that I LOVE and I always order my homefries “well-done”- haha! (Sometimes they oblige, other times, not so much- but I try!) 🙂 I’ll have to get myself some smoked paprika! And the rosemary and thyme are a MUST! I love potatoes like these that are cooked perfectly. The flavors and that crunch is yumilicious!